Tan Sri Dato’ Seri Vincent Tan Chee Yioun was born on 23 February 1952, in Batu Pahat, Johore, Malaysia. Known simply as Vincent Tan, he is a Malaysian investor, business person, and entrepreneur, best known as the chief executive and chairman of Berjaya Corporation Berhad, the company which deals with property, resorts, gambling, and golf courses in the Berjaya Group. Tan also owns Cardiff City, FK Sarajevo, and K.V. Kortrijk football clubs. His business and leadership skills have made him one of the richest people in Malaysia, and significantly contributed to his net worth. Have you ever wondered how rich Vincent Tan is, as of mid-2016? According to authoritative sources, it has been estimated that Tan’s net worth is as high as $900 million. As part of his smart investments and entrepreneur abilities, Tan owns MiTV, a Malaysian TV service provider, and it has undoubtedly improved his wealth. Vincent Tan launched his business career in 1971, and after a humble beginning, he established the steel company which turned into the conglomerate known as Berjaya Corporation Berhad in 1984. In the meantime, Tan bought a McDonald’s franchise in Malaysia in 1980, and purchased a lottery agency called Sports Toto in 1985. His company, the Berjaya Group, is involved in various businesses including recreational development, financial services, environmental sanitary landfill, motor vehicle distribution, food and beverages, and multi-level direct selling. One of Tan’s greatest accomplishments was the acquiring of the Cosway Malaysia Sdn Bhd in 1993, a highly successful direct selling and marketing company. Vincent Tan is the holder of several food and beverage franchises in Malaysia such as Kenny Rogers Roasters, with over 300 restaurants around the world. Ran also purchased Starbucks Coffee in 1998, Wendy’s restaurants in 2007, Krispy Kreme Doughnuts in 2008, and Papa John’s Pizza in 2008, all money-producing as they are consistently popular. The Berjaya Group currently holds a chain of 18 four, and five-star hotels in Malaysia, Vietnam, China, South Korea and Thailand, with more than 4,000 rooms in total. Tan is well-known for his involvement in football – soccer; he bought Cardiff City Football Club in 2010, spending over $160 million in the first four years at the club, and led them to win promotion to the Premier League in 2013. In December 2013, the Malaysian business person bought the Bosnian club FK Sarajevo and linked them with Cardiff City regarding exchanging players. Sarajevo won the Bosnian Cup in 2014 and made it to the Europa League Play-Off round in 2014-15 season. Most recently, Tan became the owner of the Belgian club KV Kortrijk in May 2015, after buying it for $6 million. Vincent Tan is a notable philanthropist; Tan founded the Berjaya University College of Hospitality in 2008, the first of the kind in Malaysia, having already established the Better Malaysia Foundation in 1997 to help in charitable and medical purposes. He sponsors numerous other health clinics in Malaysia, and also donated to the Bosnia flood relief fund after the big catastrophe that hit Bosnia in 2014. When it comes to speak about his personal life, Vincent Tan is married to Esther, and they have eleven children. 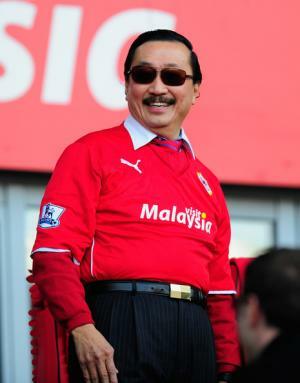 Vincent Tan: Who is Cardiff City owner? Why are his trousers so high?